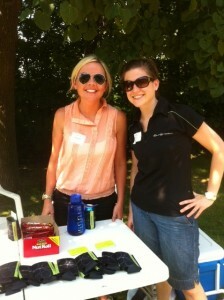 Shannon Williams and Jenny Manogue, KellyMitchell’s Minneapolis Business Development Managers, attended the Minnesota High Tech Association’s annual golf outing at The Wilds in Prior Lake, MN to represent KellyMitchell on Hole 2. The Minnesota High Tech Association is a local, membership-based, trade association made up of technology companies, and professionals, looking to positively impact the technology economy and industry in the state of Minnesota – a mission KellyMitchell feels strongly about! Shannon and Jenny spent the day trying to stay cool and talking with fellow MHTA members about KellyMitchell and the services we offer in the Twin Cities, and nationally. Their giveaway of frozen candy bars was a hit with the golfers playing 18 holes in 100+ degree heat!